A welcome victory has ensured the Steelmen will get a shot at promotion. This was a performance and result Corby Town needed. March was a tough month but they really turned on the style at Steel Park against a good Berkhamsted side who arrived in good form and hunting a play-off place themselves. But the Steelmen were well and truly back to their best. They played some excellent stuff in the first half and scored a lovely goal. And they went on to finish the job in the second period, despite the visitors coming into the game more. 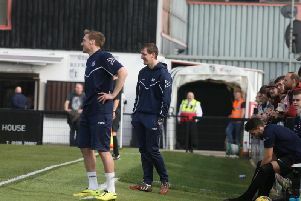 But this was a pivotal win as it confirmed Corby’s place in the play-offs. No matter what happens from here, Steve Kinniburgh’s team will get a shot at gaining promotion and that is a decent achievement in itself. With the play-off place secured, it’s a chance to pause and reflect on a good job done - so far. This season may or may not end in promotion. But one thing is for certain, the feelgood factor has been restored at Steel Park. And it’s Steve Kinniburgh who deserves a lot of credit for that. He has been a breath of fresh air since taking on the caretaker role last season before he was rightly given the job on a permanent basis. He built a decent squad with a good mix of youth and experience during the summer and, in general, the Steelmen have delivered. They haven’t had quite enough to seal automatic promotion. 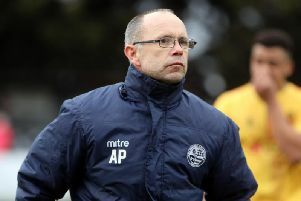 But, considering the tough times this club has had in the past few years, a shot at the play-offs is an excellent return from Kinniburgh’s first full season at the helm. It would be fantastic to see him and his players finish the job. It’s no wonder Northampton Town rate Camron McWilliams and Jack Newell so highly. Camron McWilliams recently signed a professional deal at Northampton Town and fellow youngster Jack Newell was offered one at the PTS Academy Stadium. And the duo have been showing why they are so highly rated by the Cobblers during their stints at Steel Park. Newell certainly has the look of a good footballer having impressed in midfield for the Steelmen in recent weeks. And McWilliams looks like one who could go all the way. Once again, he produced a dynamic display at right-back in this latest outing. He likes a challenge, he’s quick, he’s good with the ball at his feet and he offers a real attacking threat. It’s been good work by Steve Kinniburgh to secure the youngsters for the rest of the season and hopefully their stay at Steel Park will be beneficial for the players, Corby and, in the long run, the Cobblers. Joel Carta now has 25 goals from midfield, he has to be the find of the season. I hope he won’t be too offended by this but I’d never heard of Joel Carta until he signed for the Steelmen in the summer. But he hasn’t looked back since earning his spot after a successful trial. To score 25 goals from midfield with a month of the season still to go is some effort at any level. Carta is clearly a good footballer who helps make Corby tick. But he has this uncanny nack of being in the right place at the right time in front of goal. He’s good in the air, as was proved by his first goal in this game, he times his runs into the area to perfection and he can strike a ball well from distance. His contribution this season shouldn’t be underestimated. An incredible find for the Steelmen. March was a tough month but it ended on a high note. Now it’s all about momentum. March proved to be the month when Corby’s title hopes were all-but ended. But this win saw them finish it on a high note. With a play-off place secured and a home semi-final almost in the bag, it’s now all about momentum. The Steelmen have five games left of the regular campaign and they must do all they can to ensure they go into the extended season in good form. The signs are positive after this impressive win and they simply have to keep it going.